Best known for his abstract sculptures and serene garden design, Japanese-American artist Isamu Noguchi periodically turned away from creating art to designing objects for daily use. 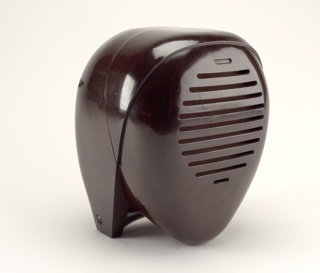 Among his earliest design work was the biomorphic “Radio Nurse” home intercom, an example of early industrial design for the Zenith Radio Company (1938), which seemed influenced by his portrait busts of the 1920s and 30s. He also designed lighting and furniture, both unique works on commission and pieces intended for mass-production. These designs often shared the minimal, abstract aesthetic so apparent in his artwork, and included his series of Akari paper lamps of the 1950s and 60s, as well as upholstered seating, stools,... more. We have 3 objects that Isamu Noguchi has been involved with.